In recent times pasta has become one of our favourite foods. Popular with children and adults alike it is one of the most versatile of all ingredients. 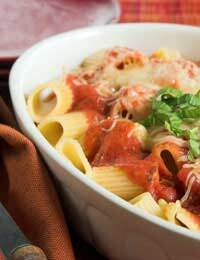 There are numerous ways of serving pasta but one of the heartiest and most warming, is pasta bake. Quick to make with no frills and fuss, it will also happily wait in a warm oven until you are ready to eat. Pasta comes in an enormous variety of shapes and any you have to hand can be used for pasta bake – but perhaps the best would be a firm, small pasta such as fusilli or penne. Pasta can be bought either fresh from the chilled counter at a supermarket or else dried in packets. Fresh pasta will keep in the fridge for a few days with little deterioration or can be frozen and used straight from the freezer. Dried pasta makes for an essential store-cupboard item as it keeps perfectly. Either can be used successfully for pasta bake, but if using dried, it will cook more quickly if you first soften it in boiling water for 5 to 10 minutes. Fresh pasta of course cooks much more quickly than dried (just 3 or 4 minutes), but both take a very short amount of time. Cheese and tomato is probably the most popular flavour of the pasta bake dishes. At its speediest, simply tip a pack of fresh pasta into an oven-proof dish; pour in a jar of ready-made tomato pasta sauce and top with grated cheese. Bake in a pre-heated oven at Gas Mark 4 or 180°C for 30-40 minutes or until piping hot and bubbling. If you wish to make the sauce yourself, it is very easy. Just cook some finely-chopped onions in a pan, skin and de-seed some tomatoes (but no need to if you are short of time – just use tinned tomatoes) and add to the mixture. Then mix in some passata (tomato sauce from finely chopped and sieved ripe tomatoes) and hey presto, you have a sauce which has been freshly made and will be lower in salt. There are a number of variations you can make to alter the flavour of your pasta bake, such as adding sliced, cooked mushrooms and single cream (for a creamier mushroom sauce) or bite-sized slices of cooked ham or bacon and some ricotta cheese. If you want to add protein but don’t like the idea of chicken or ham, then fish can be used just as easily with pasta. Salmon or tuna are good staples, but other seafood, such as prawns also work well. First cook the salmon and break into pieces, or if preferring tuna, use straight from the can, then add the tomato or cream sauce and cook as before. Season well with pepper and add the cheese on top. If you like the top of your pasta bake to be crunchy, an idea would be to try incorporating some day-old white breadcrumbs, some scrunched up cornflakes or crisps in with the cheese. Don’t forget cheese can often be quite salty in its own right, but you can add more flavour with dried herbs, paprika, black pepper or a little grated nutmeg.